As many customers that call us testify, getting a true white glass tile is not so easy. Many so called ‘white’ glass tiles have a green tint to them. The green tint is natural in glass tiles. 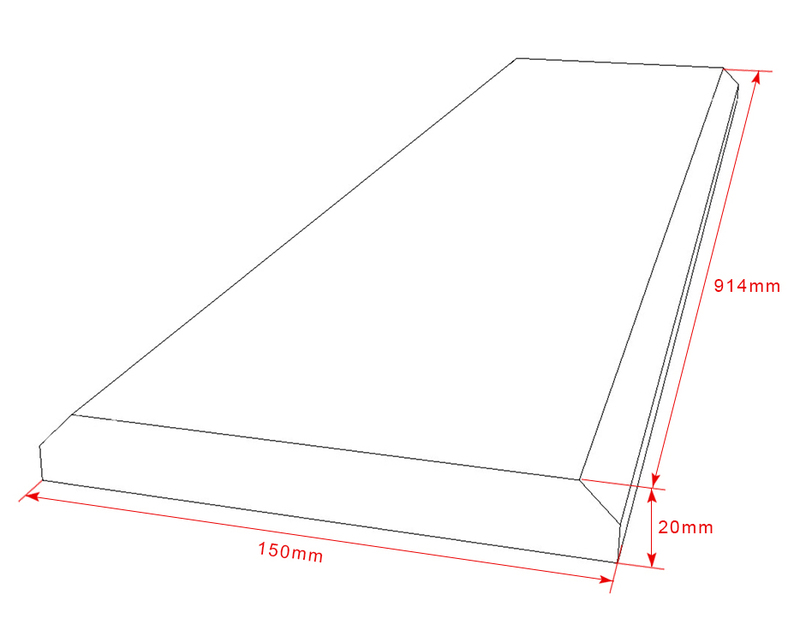 What you need in order to make a true white glass tile is Virgin glass, the problem is that costs more. Brilliant white glass tile we wanted what can only be described as a “Brilliant” white the very best. We use Virgin glass and that is how we get a perfect white color. Available in 3×6” a 4×8” size and 4×12” along with matching trims in our Brilliant Glass Tile collection. You can see how white the subway tile honed has fewer veins on the tiles and some are actual blank tiles mixed in. This is what creates a whiter appearance. Blanks mixed in with the boxes is no accident. 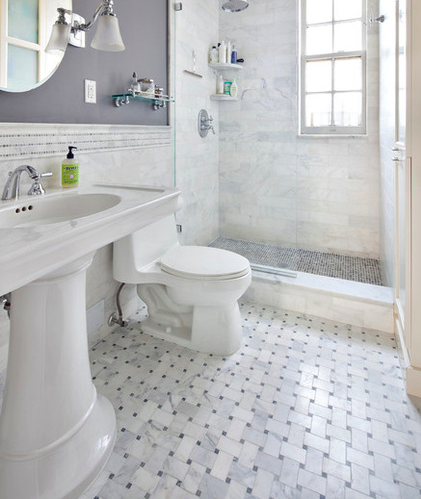 Carrara 1″ Hexagon used on the bathroom floor above. 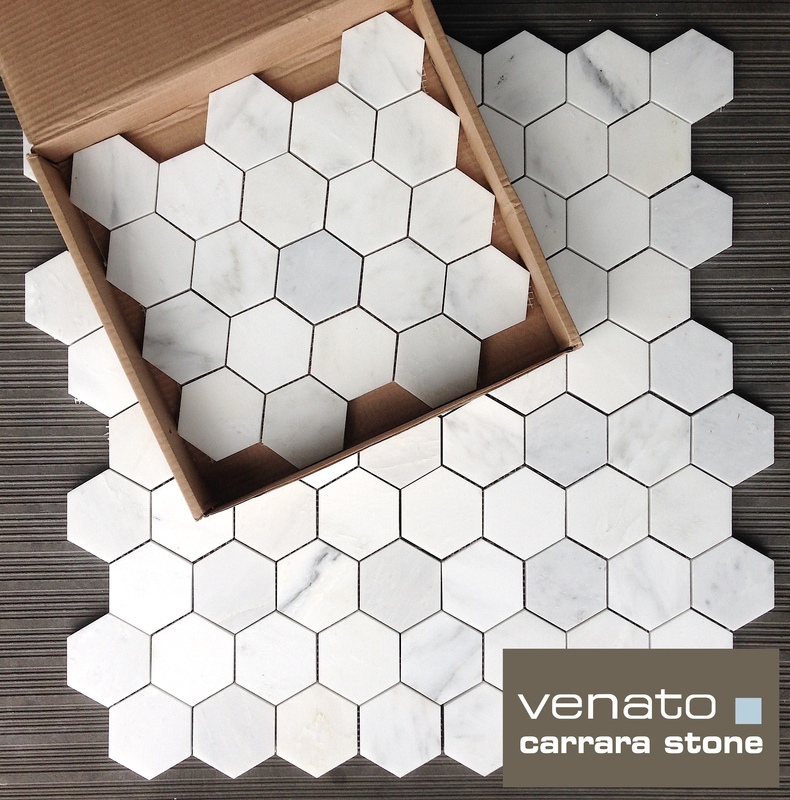 The Venato 1″ Hexagon $10.95SF will give you the same whiter look. 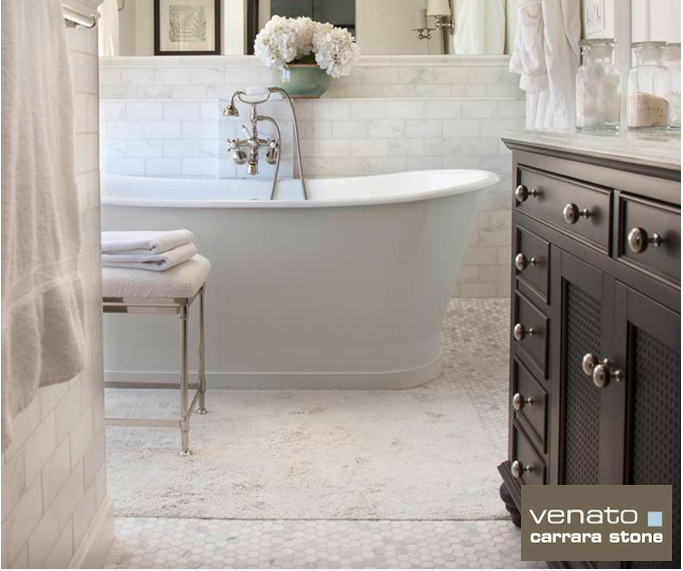 It does not matter which mosaic you select from the Venato collection. 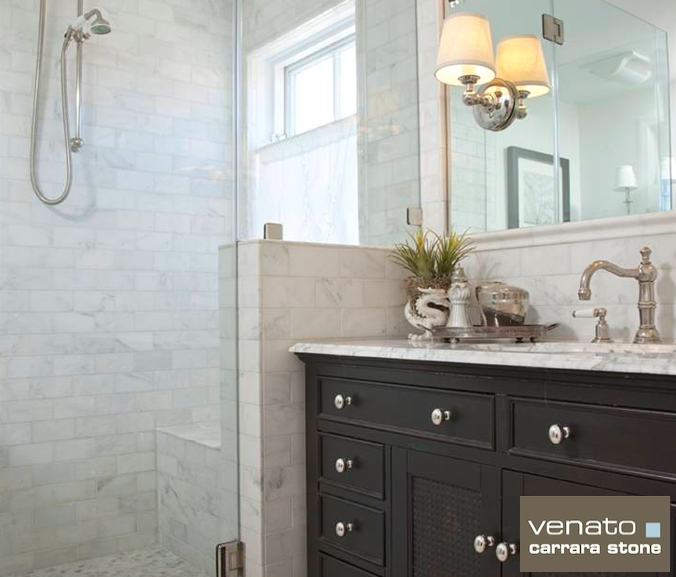 The Venato Carrara marble collection is consistently whiter based marble to that of traditional Carrara tile. This mosaic above is our Dogbone Carrara Venato $12.95 a square foot. 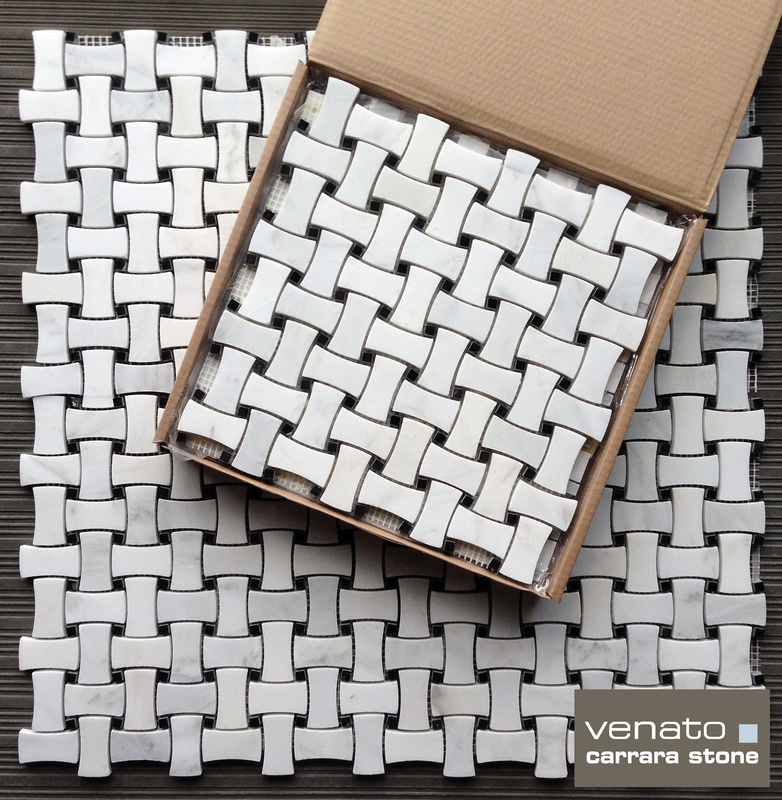 Above is our Venato 3×3″ Hexagon Mosaic Tile $11.75SF again incredible white base, perfect for a whiter look bathroom. It should come as no surprise that we purchase samples from our competitors. We want to be sure what we are offering is the best value for our customers. We want to be sure that if a customer orders samples from the ‘market’ that we would be at the top of the list of who to buy from. But Centuries of digging this beautiful rock out of the mountain, generational businesses handed down through they families. It is easy to understand why and lets face it I doubt anyone wants to rock the boat no one wants to wake up one morning with a block of Carrara in their bed (think Godfather). The sheets are smaller, they have just 36 Hexagons per sheet (they take off an entire row). The Hexagons are smaller, so you loose a row and then the Hexagon itself is smaller making 17% less coverage than our sheet of Hexagon. 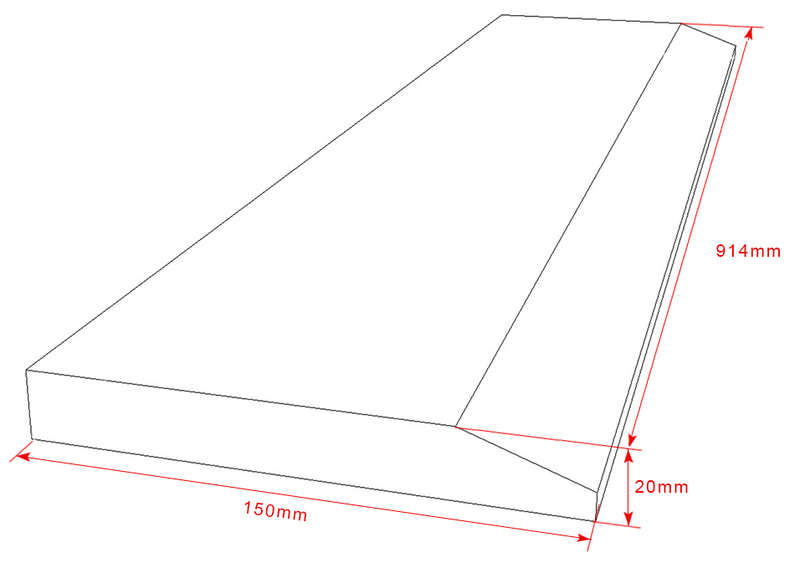 It is thinner, I measured it and it was 6mm which is 1/4″. That is thin. In our opinion too thin for a floor tile (which is where most people use this mosaic). In Conclusion, buying samples is a great way to make us feel proud of what we offer our customers. If all things were equal our price is actually less and you get a thicker tile, not only thicker but the actual recommended thickness of a floor tile. Added in 2017…. Installation Bianco 2″ Hexagon. I love Instagram. It is so simple for people to post pictures of their work and our marble installed. Then to confirm it is our marble, they can tag it like the picture below. Bianco 2″ Hexagon Mosaic $11.75 a Square Foot and Free Shipping (as of Feb 2017). Allows everyone to see where all the products come from in this powder room. The Hexagon from here. This month our new Thresholds, Saddles or Transitions (they come under a few names) arrived. A great finishing piece for the bathroom doorway, shower step to name just two. Part of our business is complete bathrooms as we are great at matching different tile sizes, with mosaics and trims making the shipment look like it came from one block of Carrara (or as close as can be done with natural stone). Our average order size is 250 to 350SF square feet. Made up of tiles and mosaics. The thresholds are aimed at these customers. The complete bathroom customer. The type of customer where we have to ship the order on a pallet or in a wooden crate. The amount of product ordered creates a lot of weight which increases the stability of the shipment. The major issue we see with this product is with shipping it. This product cannot ship on it’s own UPS ground. It will get broken. It can only ship on a crate with a tile order of 100SF+. Why do we need 100SF plus? We need the weight of the tile to hold the pallet in place on the truck. (We could try 70SF, send us an email. But ideally 100SF). I ordered 200SF for a bathroom, but did not order this. Can it ship UPS ground? No it cannot, how could we get it to you? UPS will throw it, they will break it. Then you will need us to ship you more. This will happen over and over again. It is no possible. Has to ship on a pallet. And that pallet needs weight to stop it shifting. I really, really need this what can be done? There are a couple of options a) You collect it from our warehouse in Alpharetta. b) The product is 36″ long. You ship to us a cardboard box or a form of packaging you want this shipped in, including any packaging materials. You detail how you want it packed. You send UPS label. Then order. Then we are out of the loop, so when UPS throws your package and breaks the marble – you can file a claim with UPS for the product yourself. By the way filing a claim with UPS is pretty much impossible, they make it this way so they do not have to pay for any claims. Once you are put in the position we are in of how you ship a piece of this, I think you would conclude the same as us, it is not very difficult, unless on a pallet/in a crate. Future Plans: We will work on ways to try and ship it on its own, in time we hope to be able to come up with a plan. Perhaps it needs to be attached to a 37″ piece of wood – that was just an off the cuff while writing this blog idea :). But at this time we do not have a solution to ship single units. So I am sorry if you need it. At this time we just cannot get one piece to you. 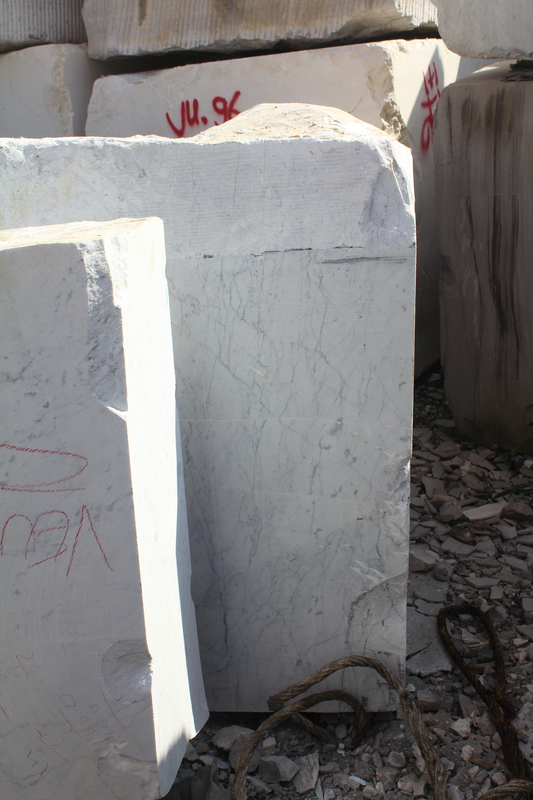 In the background is lot# 683535-12 ‘C’ Grade Italian Marble 12×24″ Honed $9.95SF (we only import ‘C’ grade but as with everything occasionally there is the exceptional). On top of it is 12×12″ CD Grade Italian marble. Available almost everywhere. On it’s own without comparison lower grade Carrara looks okay. Put it next to our tile and their is no comparison. Let me take you through the decision making process and you see which direction you would have chose when importing Italian marble. It was the Summer of 2014 in Carrara, Italy, blocks were cut, all you had to do was choose which blocks you wanted to have cut into tiles. They would then be cut up into the sizes you specify (12×12“, 6×12“, 12×24” etc), boxed, put inside wooden crates and shipped to the USA. Which blocks do you choose? There are hundreds of them. There are a huge number of darker gray blocks with little veining. There are far less white colored blocks. The price of the blocks is reflected by this supply and demand. Now comes the decision making: Pay $3 to $4SF less than the premium white for the gray blocks. Or opt for the best this white mountain has to offer. You have to make a choice pay the lower price and import the ‘CD’ grade like almost every other US importer of Carrara or go for the premium product. The whitest base Carrara Bianco available. The USA is a very price sensitive market. If we did not buy these blocks of Carrara then most likely it would head off somewhere else in the world. But everything comes back to the same question “what would I want in my bathroom/kitchen?” and “what would I want to wake up to and look at for the nest 20 years or more?”. Given the length of time this Home Improvement will last, I want the best marble I can get a couple of dollars a square foot more is okay as long as I understand the rationale behind it. Hope this explains why our quality of Carrara is so high, it is no accident. We have selected blocks to get the best look. Italy charges more, it does not fit what everyone is looking for, some people are all price ( I understand that, perhaps it is a flip) we are price and quality. 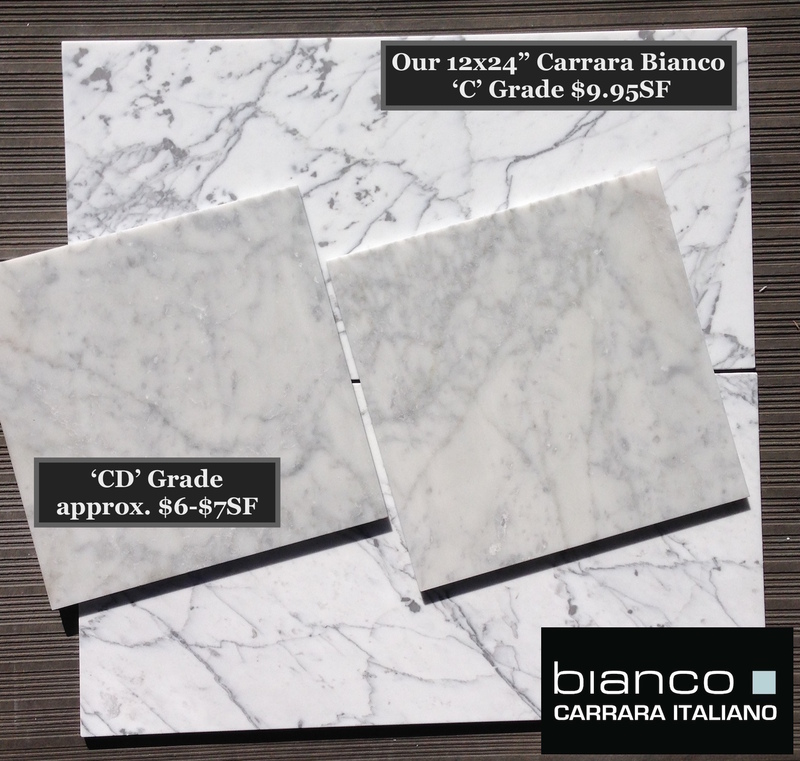 See for yourself, order a sample, call us, ask for pictures of our current lots compared to ‘CD’ grade Carrara. Communication is the key, it is a big project, work with us, we are here to help! Questions email sales@thebuilderdepot.com or call 800-308-9359.